One morning last week, I sat working at my desk looking out over the garden. The weather was a blustery spring day, one minute sparkling sunshine and the next minute a torrent of wind of rain. Two magpies, flew back and forth all morning, twigs in beaks, calling loudly to one another. They sang through the heaviest downpours and flew through the clean spring sun. I watched them working, gladdened by the sight of their busy hearts. Last summer two Magpies nested in our garden. They cawed angrily every time we innocently moved too close, and one day I watched them diving at one of the cats. They squawked and cawed all season, and come summer there were four of them, two smaller and fluffier than their parents. The one baby disappeared quickly, we wondered did he die? but the third remained right until late autumn. She would often come closer than her parents tempted by scraps of food we would leave, and they would sound their angry cries until she retreated – a sparkle in her clever corvid eye. I wondered if the pair I watched that morning were the same, and thought how lovely if our home was their home too. 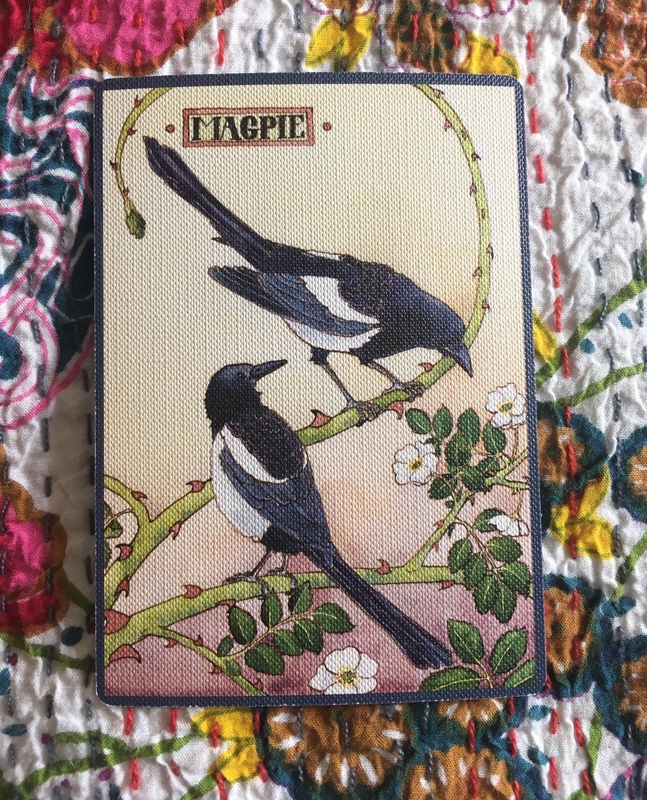 Later that day, I went to draw my ‘card for the week’ from The Green Wheel Oracle deck – the card I drew by chance was Magpie. And here it was…my morning, my March, my year in a bird. The balance of light and dark, in life, in seasons, and in the colors of this beautiful bird. The spark of movement that makes a life dimensional. I can think of no more beautiful and befitting creature to represent the month of the Spring Equinox. So full of possibility.